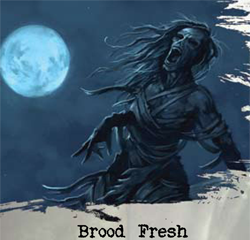 Brood Fresh is scenario eight. It was first published on November 6, 2008. Arkham has seen lots of horrible things, from snake men and masked creatures to toad-like entities and sanity shattering plays. Now it faces destruction from within. Prepare to face the horror of Eihort! Investigators must reduce their max stamina or sanity by 1 for each brood token they have. Setup as normal, adding the components from Kingsport Horror and Curse of the Dark Pharaoh. This page was last modified on 21 December 2009, at 09:52.